TimePilot is going mobile! Our first iPhone App is now available at Apple’s iTunes App Store. [Editor's Note: This app has been replaced by our latest iPhone app, also available at the App Store.] The TimePilot iPhone App turns your iPhone into a portable timeclock. Employees can clock in and out at an iPhone and the results can be transmitted to the PC running TimePilot Central. The App also runs on the iPad and the iPod Touch. A single employee can clock in and clock out with their iPhone. A supervisor can have multiple employees on his or her iPhone, and clock in and out individual employees (or hold the phone while the employees clock themselves in or out). Instead of employees, you can use the App to track tasks: For instance, you’d set up various tasks on the phone, and when you started one you’d clock in and when you finished you’d clock out. Set up your employee(s) or tasks on the iPhone(s). Alternatively, you can easily import the list of employees you have set up in TimePilot Central into your iPhone. Have your employees clock in and clock out transactions. You can also add or delete transactions for individual employees. When you’re ready to send the data to TimePilot Central, tap a button on the iPhone to transmit the data. 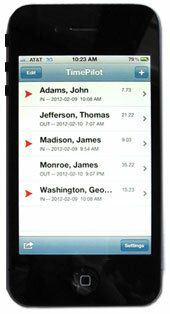 Using TimePilot Central, click the "File" menu and then "Retrieve Phone Transactions." You’ll see an icon for each iPhone; if the name of the iPhone is in red, that’s an indication that there’s data to be imported. To import the data, right-click the phone’s icon and choose “Get Transactions from Phone."